Enter an internationally significant archaeological and historic Calusa site! Along with a visit to the Randell Research Center, you can travel on the Calusa Heritage Trail. The 0.9 mile interpretive walkway will lead you through the mounds, canals, and other features of the Pineland archaeological site. Along the way you will get detailed information regarding the Calusa Indians who inhabited the Pineland site. Highlights include learning about the Calusa culture and environment and a trail with observation platforms atop the site’s tallest shell mound. Trail-side benches and a boardwalk and bridge provide access over low-lying areas. For many centuries, the mighty Calusa accumulated huge shell mounds, engineered canals, and sustained tens of thousands of people from the fish and shellfish found in the rich estuaries west and south of Fort Myers. Here in the estuarine landscape between Charlotte Harbor and the Ten Thousand Islands region of the Everglades are the small number of remaining shell mound sites. On the Calusa Heritage Trail, visitors can tour an internationally significant site and learn about Calusa culture and their environment. Museum-quality interpretive signs along the Trail provide visitors with detailed information regarding the Calusa Indians who inhabited the Pineland site, their culture and environment, and the history of Southwest Florida after the Calusa left. The trail also features observation platforms atop the site’s tallest shell mound, in addition to benches and a boardwalk and bridge over low-lying areas. Why is this site so significant? 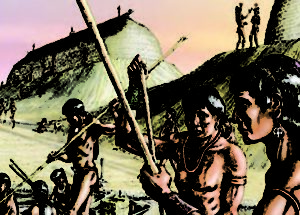 For over 1,500 years, the site near the waters of Pine Island Sound was a Calusa Indian village. Perhaps you can imagine the many centuries of Indian village life as you examine the remnants of the village and the ancient canal that reached across Pine Island. Early Florida pioneer history is reflected in historic structures. The native plants and animals characteristic of pinelands, coastal hammocks, and wetlands can be found during your exploration. Archaeological and ecological importance seems to fill the air. The remains of centuries of Calusa daily life reveal a fascinating, complex world that existed before the arrival of Europeans. Waterlogged deposits preserve artifacts not found in dry sites and include ancient botanical remains found nowhere else in North America. Pineland provides a key to understanding larger, global issues; accumulated deposits hold information on sea-level fluctuations and climate changes that scientists all over the world can study and add to the earth’s environmental history. The site has proven to be an ideal location for teaching students and the general public about Florida’s environment and history. The motto of the Randell Research Center on the Calusa site is “As We Learn, We Teach.” The Randell Research Center (RRC) is a program of the Florida Museum of Natural History and has conducted research and education programs in Southwest Florida since 1983. 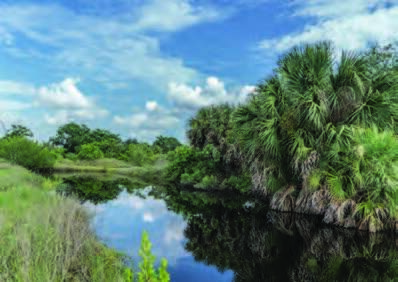 The Randell Research Center (RRC) is a permanent facility dedicated to learning and teaching the archaeology, history, and ecology of Southwest Florida. Get out and enjoy The Great Florida Outdoors!